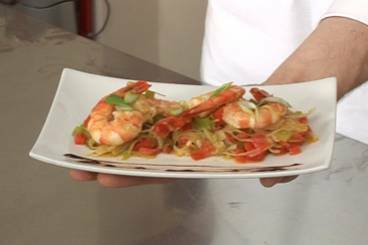 Wok-fried prawns with peppers, spring onions, leeks, lime juice and preserved lemon. Remove the heads and shells from the prawns, leaving the tail intact. Use the tip of a sharp knife to remove the black spine. Thinly slice the springs onions. Cut the preserved lemon skin into small dice. Discard the flesh. Cut the leek in to thin slices. Peel the peppers and finely dice. Juice the lime. Heat a wok to very hot and add a little olive oil. Add the prawns to the pan and cook for 1 minute on each side. Season with fleur de sel and piment d'Espelette then set aside on a sheet of kitchen towel. Place the leeks in the wok and add a pinch of salt. Cook over a low heat for 5 minutes. Add the spring onions and the pepper, adjust the seasoning and add the preserved lemon peel. Mix well and cook for 5 minutes. Return the prawns to the pan and add the lime juice. Check the seasoning. Serve the prawns on a bed of vegetables.